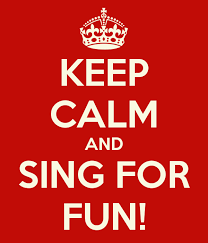 Sing for Fun evening I'm doing again at the Village Hall on Tuesday, 28th February (starts 7.30 p.m.). It's just singing a mixture of rounds and simple harmonies and aimed at anyone who wants to get together and have a sing! No requirement to read music as I take people through each line until they feel confident. Entry is free but any small donation towards the hire of the hall etc.. appreciated!